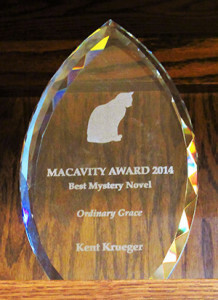 The Macavity Award is named for the “mystery cat” of T.S. Eliot (Old Possum’s Book of Practical Cats). Each year the members of Mystery Readers International nominate and vote for their favorite mysteries in five categories. The year listed is the year of the award, for books published in the previous year. The Doctor Digs a Grave by Robin Hathaway (St.